1 medium apple contains 80 calories and 3 g of dietary fiber. Apples contain an antioxidant known as quercetin which has natural antihistamine and anti-inflammatory properties and may thus reduce allergic reactions. Apples also contain other antioxidants known as flavonoids which can reduce the risk of developing diabetes. 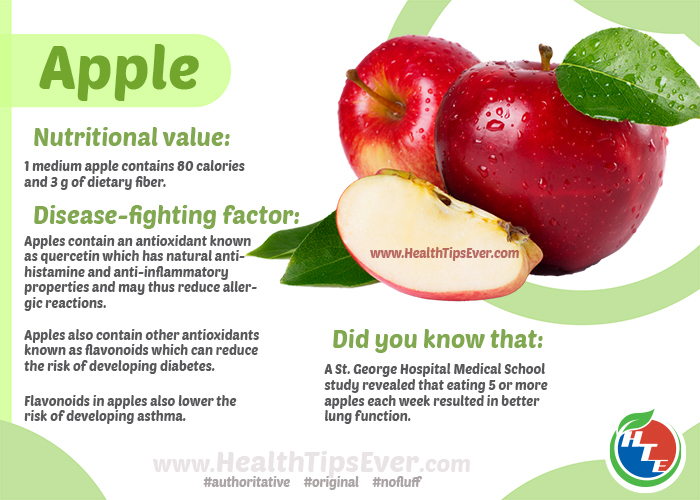 Flavonoids in apples also lower the risk of developing asthma. A St. George Hospital Medical School study revealed that eating 5 or more apples each week resulted in better lung function.